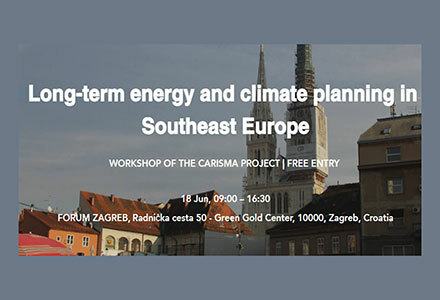 June 18th – workshop titled “Long term climate and energy planning in Southeast Europe” will be organised in Zagreb within the framework of the EU funded CARISMA project. How to transform energy and climate plans into actionable and bankable projects in Croatia and the region? What can we do to strengthen the link between energy and climate science, policy and practice in Southeast Europe? Southeast European countries have various experiences in long term energy and climate planning, and are generally facing several challenges such as dependence on coal power in their electricity mix, stop and go renewable energy policies such as the example of Bulgaria and Romania, high costs of capital for wind and solar PV and social acceptance challenges of renewable energy in general. The Western Balkan and Energy Community member states are moreover in several phases of the negotiation process to enter the European Union. As this requires adopting the EU energy and climate acquis these countries also have to develop climate strategies that address mitigation and adaptation measures. This workshop will bring together the leading experts in energy and climate policy from Europe with some of the most successful investors and practitioners from the region. This includes Oliver Sartor from the Paris based think tank IDDRI, Andreas Tuerk from Joanneum Research and University of Graz and Sonja Risteska from the Berlin based Agora Energiewende, a renowned think tank for the energy transition. On the other hand leading investors and consultants from the region will discuss how high level plans can be placed into practice. This will include Bojan Rescec from RP Global, an investor with 78 MW of wind capacity in Croatia, Edo Jerkic from Renewable Energy Sources of Croatia, Nihad Harbas from the Sarajevo based advisory nLogic and Belgrade based Dimitar Dimitrovski from the International Finance Corporation. More details at Starfish Energy and Klub Alpbach Hrvatska.